A woman rejects her husband's heart--and gives it back to him, still beating, in a plastic box. A little boy betrays his father to the harsh mercies of Santa Claus. A widower suspects his dead wife's face is growing over his own. A man goes to Hell, and finds he's roommate to the ghost of Hitler's pet dog. Giant spiders, killer angels, ghost cat photography, and the haunted house right at the centre of the Garden of Eden. Deliciously frightening, darkly satirical, and always unexpected, Robert Shearman has won the World Fantasy Award, the British Fantasy Award, the Shirley Jackson Award, and the Edge Hill Reader's Prize. 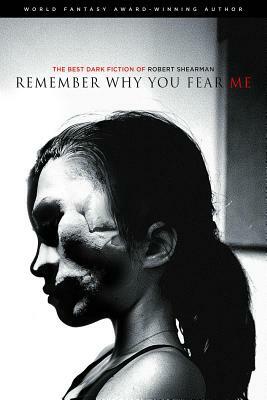 Remember Why You Fear Me gathers together his best dark fiction, the most celebrated stories from his acclaimed books, and ten new tales that have never been collected before. Robert Shearman has worked as writer for television, radio and the stage. He was appointed resident dramatist at the Northcott Theatre in Exeter and has received several international awards for his theatrical work, including the Sunday Times Playwriting Award, the World Drama Trust Award and the Guinness Award for Ingenuity in Association with the Royal National Theatre. His plays have been regularly produced by Alan Ayckbourn, and on BBC Radio by Martin Jarvis. A selection of his plays have been collected in book form as Caustic Comedies. However, he is probably best known as a writer for Doctor Who, reintroducing the Daleks for its BAFTA winning first series in an episode nominated for a Hugo Award. He has also written many popular audio dramas for the series for Big Finish. His first collection of short stories, Tiny Deaths, was published by Comma Press in 2007. It won the World Fantasy Award for best collection, was shortlisted for the Edge Hill Short Story Prize and nominated for the Frank O'Connor International Short Story Prize. No Looking Back was selected by the National Library Board of Singapore as part of the annual Read! Singapore campaign. The two series of The Chain Gang, his short story and drama project or BBC7, both won the Sony Award. His second collection, Love Songs for the Shy and Cynical, was published by Big Finish in 2009. It won the British Fantasy Award for best collection, the Edge Hill Short Story Readers Prize and the Shirley Jackson Award, celebrating outstanding achievement in the literature of psychological suspense, horror, and the dark fantastic. History Becomes You, from this third collection, Everyone's Just So So Special, was nominated for the Sunday Times EFG Private Bank Award. Most recently, his best dark fiction was collected in Remember Why You Fear Me by ChiZine Publications, followed by his best weird fiction in They Do The Same Things Different There. He is currently writer in residence at Edinburgh Napier University.